The box I was gifted with had jasmine added to the cacao shells and it added a very nice light top note to the tea. 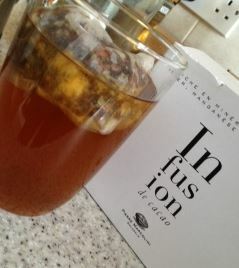 The flavour was subtle but present and it gave my tea a little bit more complexity to the flavour. The tea does not taste like a chocolate bar but it does have a distinct chocolaty flavour. I did not add sugar to mine – an essential ingredient in anything but 100% chocolate – and so it is possible to bring it closer to a bar with sugar but why add it? This rich tea tastes wonderful on its own, with or without jasmine. It is hand-made from some of the best beans in the world, roasted on-site at Pierre Marcolini’s factory, and hand-packed into each special tea bag. Whether you are trying to cut down on the amount of chocolate you eat or just want to try something different, this tea is absolutely delightful and best for me – caffeine free.